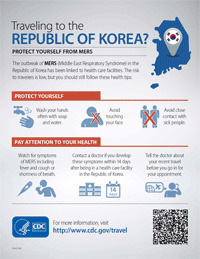 On May 20, the Republic of Korea (South Korea) reported its first laboratory-confirmed case of Middle East respiratory syndrome (MERS). As of June 23, 174 cases in the Republic of Korea have been confirmed by the World Health Organization. All transmission has been linked to health care facilities where MERS patients were treated. MERS, a viral respiratory illness, was first reported in Saudi Arabia in 2012. Symptoms of MERS include fever, cough, and shortness of breath. Be sure you are up-to-date with all of your shots and, if possible, see your health care provider at least 4–6 weeks before travel to get any additional shots. Contact your doctor if you develop a fever and symptoms of respiratory illness, such as cough or shortness of breath, within 14 days after being in a health care facility in the Republic of Korea. Tell your doctor about your recent travel and presence in a health care facility before you go in for an appointment. Health care providers should be alert to patients who develop severe acute lower respiratory illness (such as one that requires hospitalization) and were present in a health care facility in the Republic of Korea within 14 days before illness onset. Consider other more common causes of respiratory illness, such as rhinovirus infection. Evaluate patients by using CDC’s MERS case definitions and guidance. Immediately report patients with unexplained respiratory illness who meet CDC’s criteria for patient under investigation (PUI) for MERS to CDC through the state or local health department.